As summer winds down and schools re-open, some mourn the loss of hot, carefree summer days at the beach, while others rejoice at cooler nights and empty houses (I see you, moms everywhere!). For those who garden, or anyone who eats locally, you know this means that corn and potatoes are coming to the end of harvest season. There isn’t much better than biting into a crisp, sweet corn on the cob! 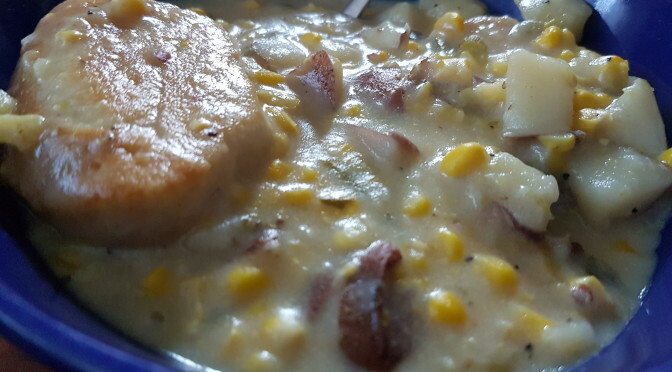 But in case you get tired of that, this is a great way to use corn, or feel free to substitute in canned or frozen too. 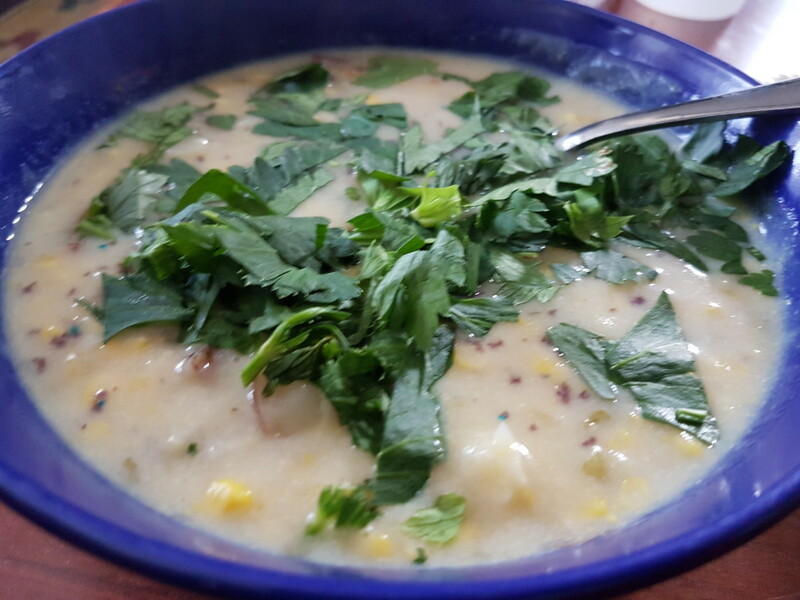 Now that the heat of summer is starting to wane, soups and chowders become more tempting. 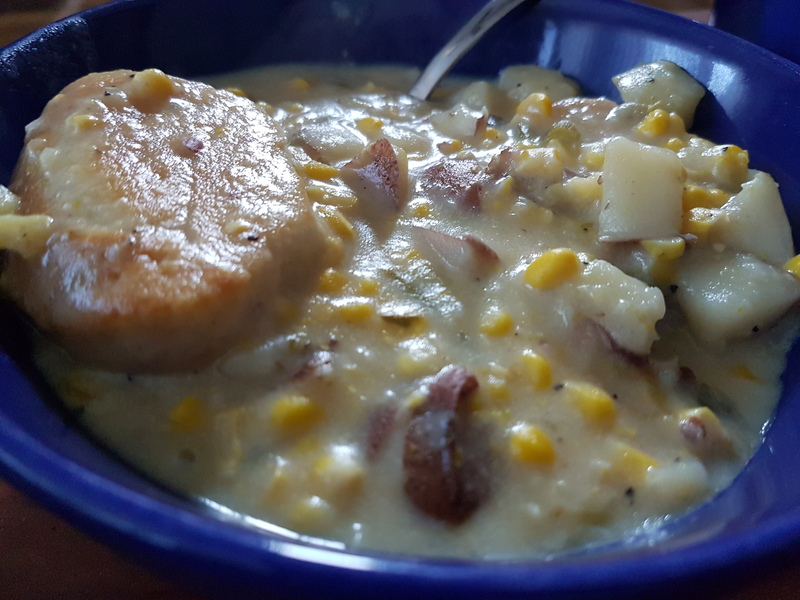 Save some of your bumper crop of corn in the freezer, and potatoes store well for months in a cool dry place, and you can have this chowder anytime in the coming months. You can take fresh cooked corn cobs, and using a sharp knife just cut all the kernels right off. Freeze those in bags, and you will have a taste of summer any time. Or use the freshest, sweetest corn you can get your hands on and make it right now! Step 1: In a frying pan, cook the onions, leeks, garlic, and potatoes in oil for 10-15 minutes, until onions are translucent and potatoes are soft. Add the corn and chicken stock, bring to a boil for 3-5 minutes. Step 2: Remove a few tbsp of the soup, and add the flour to it. Mix well to create a roux, then pour back into the pot along with the milk. Bring to barely a simmer, season to your tastes. Serve with fresh biscuits and top with fresh parsley if you like! In a frying pan, cook the onions, leeks, garlic, and potatoes in oil for 10-15 minutes, until onions are translucent and potatoes are soft. Add the corn and chicken stock, bring to a boil for 3-5 minutes. Remove a few tbsp of the soup, and add the flour to it. Mix well to create a roux, then pour back into the pot along with the milk. Bring to barely a simmer, season to your tastes. Serve with fresh biscuits and top with fresh parsley if you like!